Ultrasonic machining is changing the manufacturing industries with its superlative performance. The main reason why this machining process is used in the manufacturing area is because it evolves less heat in the process. 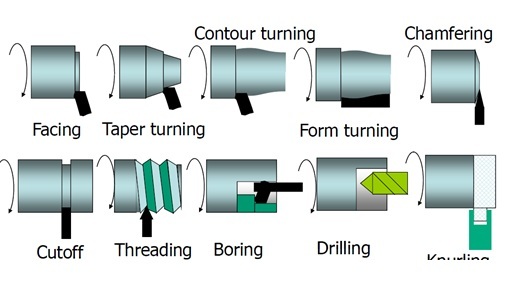 All the operations done with the ultrasonic machining method are cost effective and best in results. Ultrasonic machining is an abrasive process which can create any material into hard and brittle form with the help of its vibrating tool and the indirect passage of abrasive particles towards the work piece. It is a low material removal rate machining process. It is also known as Ultrasonic impact grinding is an operation that involves a vibrating tool fluctuating the ultrasonic frequencies in order to remove the material from the work piece. 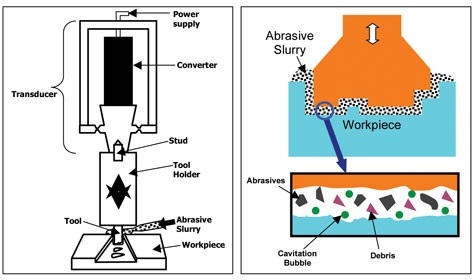 The process involves an abrasive slurry that runs between the tool and the work piece. Due to this, the tool and the work piece never interact with each other. The process rarely exceeds two pounds. This method is the best choice for working with hard materials such as ceramic matrix composites, ruby, piezo-ceramics, glass, ceramics, Quartz, ferrite, diamonds, technical ceramics, alumina, PCD, sapphire, CVD silicon carbide and similar ones. The tool present in the machine for cutting the materials is made from a soft material as compared to the work piece. The tool is usually made from materials such as soft steels and nickel. When the tool vibrates, the abrasive slurry (liquid) is added which contains abrasive grains and particles. The abrasive slurry is added till the work pieces interacts with the grains. Due to the particles of liquid added, the work brittleness of the work piece abrades the surface meanwhile the tool deforms gradually. The time spent on ultrasonic machine entirely depends on the frequency of the vibrating tool. It also depends on the size of grains of the abrasive slurry, the rigidity and the viscosity as well. The grains used in the abrasive fluid are usually boron carbide or silicon carbide as they are rigid than others. The used abrasive can be carried away easily if the viscosity of the slurry fluid is less. Ultrasonic machines are the future of machining which is used all over the world for creating hard and brittle forms of materials for the industrial uses. A lot of operations can be performed with the ultrasonic machine which can benefit the industrialists in a variety of ways. The advanced technology creates solution which helps in opening up the market opportunities and has made things easier.